Sehr schönes und sauberes Haus. Ideal für alle Altivitäten in Zentralflorida. Wir (2 Erwachsene/ 2 Kinder 11/14 Jahre) haben uns hier sehr wohl gefühlt. Von hier aus könnte man alle gewünschten Ziele (Disney, Cap Canavaral, Tampa, Rainbow River etc.) immer leicht erreichen. Alle notwendigen Dinge haben wir im Haus gefunden. Das Haus kann man sehr empfehlen. Many hanks for staying at our home and for the review, much appreciated. Glad you enjoyed your stay and I hope we can welcome you back again sometime. We (4 Ad. 1 Chd.) had a great time at Jeremy's house. It was a nice clean an spacious house with a wonderful Pool. The kontakt with the owner Jeremy was absolutley great. He gave us all the Informations wie needed. 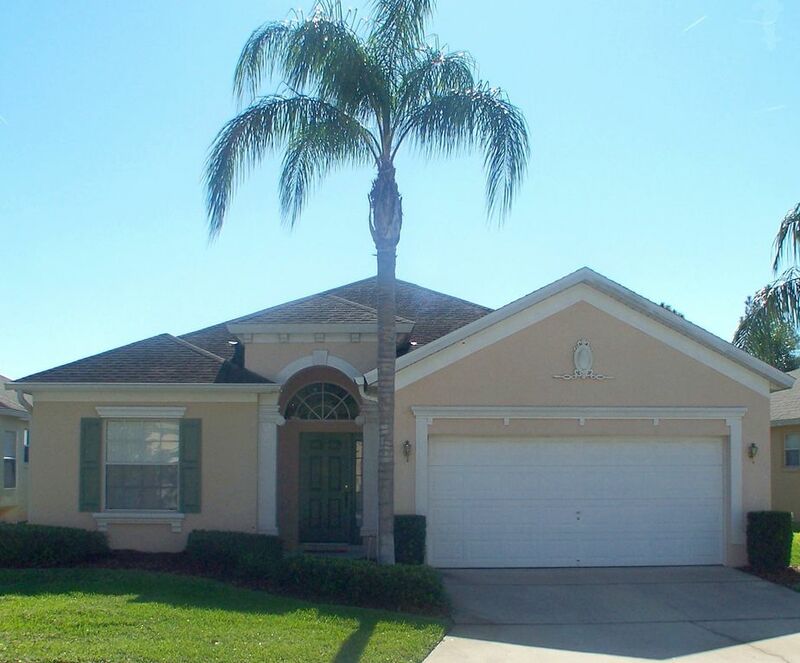 We'll book this house again if we'll stay in the Orlando area. It was perfect. Thank you for the review, we appreciate it. So glad you enjoyed your stay. I hope we can welcome you back again some time! We stayed for 9 nights over New Year. The villa is well looked after and in a nice area. There are supermarkets and restaurants within a 5-10 min drive. The owner Jeremy is really keen to ensure that you have a good stay - he provided lots of useful information in advance and was available for queries etc during our stay. The villa is south facing so it was nice to spend a day relaxing by the pool getting sun for the majority of the day. The beds and sofas were very comfortable. The carpet had a luxurious feel-we didn’t need to use our slippers! Thanks for staying with us and for your kind comments. Yes, we try to make your stay a great one - anything we can do to help is no trouble and if we can help you eek out something more from your trip, we'll help to do so - based on our 30+ trips over now, we have a wealth of knowledge and experience to share. While exploring is fun too, some of our recommendations may not have been on people's radar. I have a theory that anything tactile in the villa must be of high quality - so the crockery, cutlery, bed linens, towels and even the carpet, we make sure we get as good as we can. I bet you didn't realise you were walking round, slipperless, on recycled plastic bottles!! We love our Mohawk carpet too. I hope we can welcome you back again. The overall experience and impression of the property was very nice. The neighbor across the street had his vehicle parked on the street a couple times which made it difficult to park in the driveway. We couldn't regulate the temperature in the house. The water to the dish washer was turned off. Other than those things the house was nice and organized. The owners were very friendly to work with. Many thanks for staying with us and spending your Christmas holiday in Florida. And I suppose it had to happen sometime, our first dropped star since October 2012!!!! The house across the street (who are permanent residents) have a small Fiat 500 which occasionally gets parked across from us. I agree this can be a nuisance and it is in breach of the Community bye-laws, so this has been mentioned to the Calabay Board previously. Nevertheless, when this scenario occurred to us in the summer, we were still able to park our 7 seat van on our drive satisfactorily. I will however, be mentioning this to the Board again and appreciate you flagging this up. While on the topic of flagging things up, neither myself nor management were notified of any issues with the A/C thermostat nor the dishwasher. Had we been, then we could have looked into it for you right away. In our pre- arrival email, the speed dial instructions to contact management are given to you in case you have any issues on arrival. We make things as easy as we can for our guests so management are only 2 button presses away! And emails we exchanged during your stay made no mention of any problems - we can't fix something we don't know about! Again though, I will follow this up with our management co. and ensure any maintenance needs are dealt with promptly. Michelle, thank you so much for your kind comments. We take an enormous amount of satisfaction from feedback such as yours, though it never stops us trying to improve! We get so many votes of thanks for the sat nav, and although you're a seasoned Florida visitor, you found, like I still do, little shortcuts and alternative routes courtesy of the nav - anything that makes our guest stays more enjoyable is worth it to me. Our information folders are constantly revised and updated and have been based now on over 30 owner trips over 17 years of visiting Florida, so there's a wealth of recommendations contained in there from both our guests and ourselves. Hopefully, the little touches like the cleaning products and pool items we leave make stays easier (though we sometimes run out occasionally, I try to leave sufficient after each trip of mine) and more fun - I have a bunch more pool inflatables to bring over in March! We look forward to welcoming you back again some time. An amazing villa that has everything you will ever need! We stayed at the Thompson’s Calabay Parc villa in November for our honeymoon and it is honestly the best place I have stayed in my life. The villa itself is spotlessly clean, well equipped (probably has more kitchen equipment than I have at home!) and very well maintained. It is in a really nice, easy to find, quiet area and is located close to local amenities such as Walmart, other supermarkets and places to eat. The villa really does have everything you will ever need, including a sat nav!- I don’t know what we would of done without it! After booking Jeremy (the owner) went above and beyond to help us with planning other aspects of our trip and providing us with very valuable information about the villa and Orlando in general before we travelled. He would always be in touch with information on anything happening at the time of our visit or any offers we might of benefitted from. Thank you we really appreciated it! This villa holds some very special memories for us now. It is a real home from home with a lovely welcoming feel that we hope to visit again in the near future! Rates are inclusive of taxes and post-stay cleaning. Pool heating - additional $125 per week - optional - likely of most benefit during cooler months of October to April. Pool heating can always be turned on by management and payable locally at $20 per day if pool temperature / weather are too cool. Long stay discounts available on rentals of four weeks and above. Contact owner for a quote.